On a beautiful Sunday morning, CanSupport held it’s 9th annual Walk for Life event. This time at a new venue Jawaharlal Nehru Stadium, New Delhi. Launched in 2008, this event is organized every year to draw attention from people around the country to come together and support cancer awareness. The walk is held on the closest Sunday to World Cancer Day that falls on 4th of February. [metaslider id=11783] This Delhi-based organization was established by Harmala Gupta, a cancer survivor herself, in 1996. Having successfully raised awareness and funds to provide free services to cancer patients, the organization is associated with famous celebs who are cancer survivors themselves like Manisha Koirala. 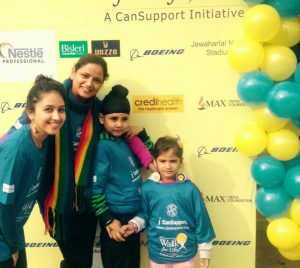 People from all over Delhi volunteer to help cancer stricken kids, adults and the elderly and help the terminally ill manage their pain and provide them comfort in this crucial time of their lives. This year, Credihealth partnered with CanSupport to provide them with online presence through social media giants including Facebook, Twitter and Instagram. Credihealth – a platform which allows a patient to compare and select doctors, hospitals, treatments and cost options from the comfort of his home – has the largest network of hospitals in the country, having signed up with over 500 hospitals including the marquee hospitals like Max Healthcare, Fortis Healthcare, Global Hospitals, Apollo Hospitals, Manipal Hospitals, Narayana Health, etc. Join our Cancer group for updates and inspiring. Like CrediHeroes Facebook Page – a platform where cancer survivors share their stories.